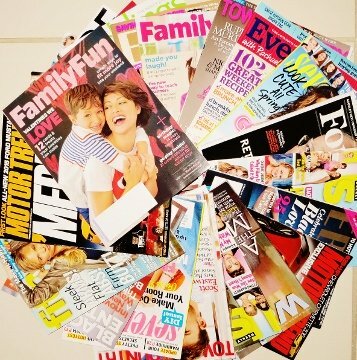 There are so many ways to get free magazine subscriptions and free magazines by mail. And, when you can't get it free, you can always get a discounted/cheap magazine subscription, so, there really is no good reason for you to pay full price for most magazine or newspaper subscriptions these days. If you’re still purchasing your publications at the checkout counters and newsstands, QUIT IT! You’re paying full price. For me, those magazines are at the check-out for one reason, to scan while I’m waiting in line, then to put back when it’s my turn up to bat. And shamelessly, it’s usually the tabloids that catch my attention, but I’ve never purchased one. I’m happy to say, that many of the other magazines featured, I’m already getting for free. In fact, if I counted, I’m probably getting about 9 magazines for free at any given time. I could get many more, but I only subscribe to what interests me, of course. With my busy schedule, I’m having a hard time even keeping up with the ones that I’m getting. After reading them, I pass them onto friends to enjoy. Once you follow my advice and start receiving your free magazine subscriptions, you will find that with many of these Discounted or Free Magazine Subscription offers, you will receive Renewal Offers or Requests. Here’s my line of reasoning with these offers. If you’re getting this magazine or publication for free, then don’t renew, even at a discounted rate. Because you’ll be able to get another subscription for free down the road. It may take a week, a month, or a few months, but most times, another free offer will come up, or you can simply use the same method to subscribe for free again. Why pay for magazines that you can get for free?! Now, if you paid a Discounted Rate for your first subscription and the renewal rate matches or is lower than the first rate you paid, then renew if you like the magazine or publication. Be sure to shred or tear up all offers that you don’t accept. Don’t just toss them in the trash. There are exceptions to this. If you just have to have a subscription, and you find that the particular magazine or publication is not being offered for free by any of the methods that I list below, and you’ve waited and you’ve watched, and it’s not coming around for free, then feel free to go the discounted routes that I mention in my non-freebies section. There are 1 to 2 magazines that I will pay for, because they are never offered for free, and although I will not mention them here, I pay a substantially reduced price for them! I inform you when Free Magazine Subscriptions become available several times per week. Check it now and you will see the tons of free magazine subscriptions that were offered just in the last week! Sign up with freebizmag to get tons of Free subscriptions. After signing up, they’ll send you emails when free magazine subscriptions become available. Sign up through an email that you check regularly so that you don’t miss out on offers, because as you can imagine, free magazine subscriptions go quickly – some within 1 to 2 days (depending on the magazine). Recyclebank is a free Points and Rewards program that allows you to earn points for learning about recycling and keeping the earth green. These points can then be redeemed for products and/or coupons. It's really easy to earn points, so your points will add up quickly! Best of all, you can get Free Magazine subscriptions through Points & Rewards Programs. I love these types of programs so much that I have dedicated a page to them Points and Rewards Programs. Visit it to learn more about this program and others. If you haven't yet joined these programs, I highly suggest that you do. Sign up for 7 Free Issues courtesy of Huggies and Parents Magazine. Sign up for a free LEGO Club Membership and you'll receive a free 2-year subscription to Club LEGO Magazine.